Since 8 months I’m the happy owner of the Panasonic Lumix GF1. It took a very long time until I had decided to buy this fantastic camera. I had the choice between Panasonic Lumix GF1 and the Olympus E-P1. Meanwhile the choice has become bigger. After I had read several test reports, user reviews and a good advice from Fotomundus24 I bought the Panasonic Lumix GF1 with the 14-45mm kit lens. The purchase of this camera was a new step for me. I had my last DSLR camera when I was fifteen. It was a Canon EOS 500N. After the Canon was broken I used different compact cameras for quick an easy photos. Those compact cameras are pretty good for fast and simple shots at a party or something else and I’m using such a camera for these purposes. You can make a photo, have a short look on it at your computer, work a little bit with the photo and then you can upload it in one of these great Online Photo Albums like Flickr, Photobucket or Picasa. Those compact camera have one disadvantage. If you had a DSLR and have worked then with some simple compact cameras you really forget the work with aperture and closure times. But with the purchase of the Lumix GF1 something should change. I really want to work with this camera. That means that I make photos in RAW and work with it on my computer. Now I would like to come closer on the camera. 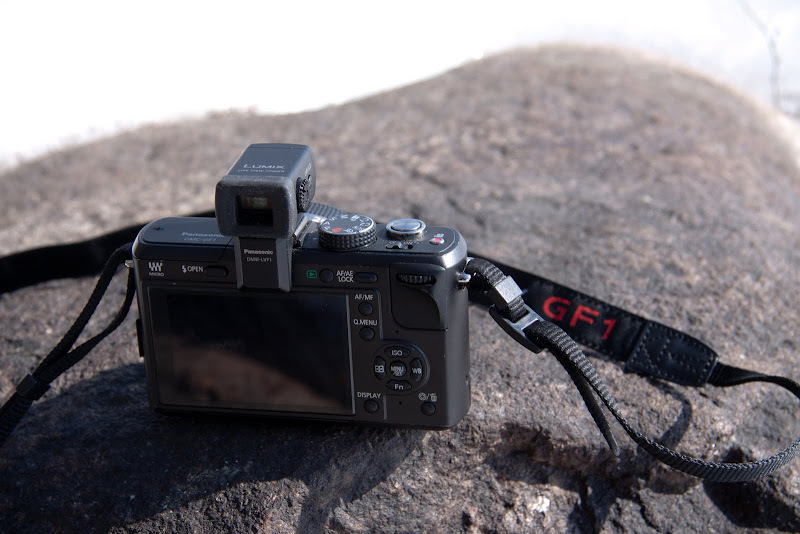 The GF1 combines the advantages of a compact camera and a DSLR. One point I really like is the weight. The camera has a weight of 566g on my scale with the 14-45mm lens and the GF1 body only weighs 365g. If you carry a lightweight tripod like the Joby Gorillapod SLR and a light camera bag you have a final weight of less than one kilo. This is excellent for such a camera. Im comparison with that, a DSLR kit would weigh the double one or even more. I’m still looking for a lightweight and waterresistant camera bag, but I still found anything suitable. A MYOG camera bag with a waterproof fabric should be the last option. Meanwhile I could use the Panasonic Lumix GF1 on several trips under different conditions. I used the camera at the Trekking Ultraleicht Winter Meeting, on my trip in the Vosges and on several day trips with rainy, windy und sunny weather. The GF1 worked very well. Specifically at the winter meeting where we had -15°C. My camera worked with no problems and the battery has also held a very long time. It was a change for me to work now with such a complex camera. Earlier I had just pressed the release button on my compact camera and the picture was on my memory card. Now I’ll take the time for a photo and use different settings, but I haven’t done this from the beginning. When I have got the camera I tested it in the snapshot mode to get a feeling for the handling. The work with the various settings was also hard work for me, because I have recently done it 13 years ago. There is still and ongoing process which still continues. Learning by doing is the best way to work with the camera. Meanwhile I use with 90% of the pictures the aperture and the different manual modes of the camera. The photos are taken in RAW and JPEG. JPEG for a fast first look at the computer and RAW for working to get an optimal result. The work at the computer with RAW pictures is also unknown territory for me. I have never used this before, because I just put the photos in a folder and that was everything. Working with the photos is very interesting. I really like it to spend a whole afternoon in front of my computer and editing the pictures, but it is really complicated to find a reasonable software for this work. Everything is a hobby and should be affordable. Meanwhile I got the chance to test some editing software. Most of this software was freeware. One of the best software I have tested was Gimp, but I was not really satisfied. At least I tested a free version of Lightroom. The work with this software is very easy because everything is simply structured. Lightroom is not really favorable, but there is a cheaper Student Version available. Now I want to come back to the camera and have a closer look at some details. I start with the LCD screen. The GF1 hast a really large 3 inch LCD screen with a huge resolution. If you aren’t using the attachable viewfinder from Panasonic, the LCD screen works as electronic viewfinder for you. This is not the best solution, but it still works. Making photos of plants and other things on the floor is very difficult. I have to go you knees to see everything on the screen. This problem would disappear if you buy the attachable viewfinder, because this one is swiveling up to an angle of 90°. Coming now to the handling of the Panasonic Lumix GF1. The handling of the camera is very easy. All operating buttons can be reached very well with the right thumb. The camera menu is well structured with lots of different settings. It is also possible to personalize the camera with your preferred settings. You can save these settings. If you shoot photos in RAW the small wheel on the backside is really necessary. With this wheel you can change your settings very fast and it works very directly with no delay. However, this button is very smooth and could have a little bit more grip. Next to the trigger button on the top, there is the red Video button. Yes you heard right. The Panasonic Lumix can make videos. Even really good videos in High Definition (HD) with 720p and 30 frames per second. You only have to push this button and the camera starts with recording the video. The quality of these videos is first-class and you can record a video up to 30 minutes in one piece. At least I want to tell you some point I dislike at the Panasonic Lumix GF1. There only some small points, but I think it must be said. My first critique point is the small wheel at the backside. This wheel could have a little bit more grip for an easier handling, because it is very smooth. Another critic point is the lens cap. I read this point in several reviews and can only agree. There is no connection between the cap and the lens. For every photo you must put the cap into a pocket. Here you can quickly lose the cap what has already happened to me. This isn’t a great loss, but it is unnecessary. Otherwise I am broadly satisfied with the Panasonic Lumix GF1. I’ve been using the Panasonic Lumix GF1 with the 14-45mm lens since 8 month and I am really satisfied with this combination, but it is time for the next step. It is time to lighten up this camera setup. The camera has a very acceptable weight of 566g at the moment, but you can still reduce the weight. You can push the weight of the camera setup with the Panasonic Pancake 20mm lens up to 466g. The pancake lens weighs only 100g and is really small. This step with this lens would reduce not only your cam weight, but also the packsize. But the lower weight is not the only reason for this step. The Pancake lens really makes beautiful photos, is very sharp and focuses quickly. It is the perfect lens for your backpacking trip and everything you need. Finally the attachable viewfinder is also an option for me to complete the camera with all important things. 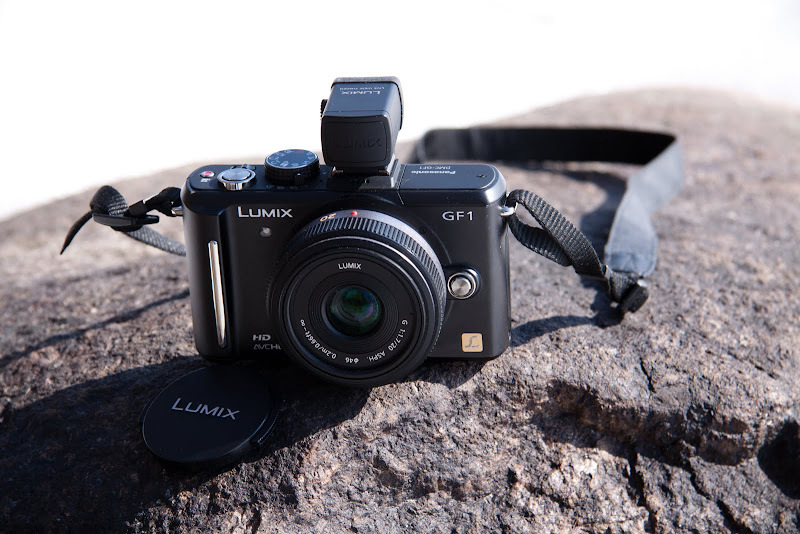 Last but not least the Panasonic Lumix GF1 is a perfect camera for beginner and for advanced user. Furthermore the camera works very good under different conditions and is very versatile. If I would buy such a camera again I would immediately take the kit with the Pancake lens. I really like the compactness and the small weight. It is the perfect cam for hiking trips and and other opportunities. The GF1 ist easy structured and has an excellent handling even if it is could you can operate the camera without taking out your gloves. A very nice camera and Panasonic feels very well built. I looked at the G1 with integral viewfinder and swivel LCD screen and liked it but it was expensive. I decided on the Olympus E-420 (I already used the E-1 & E-3) It’s quite small light for a DSLR at around 700g including CF card, battery and lens but I’d still prefer lighter and smaller. It’s a difficult choice, the compact size of the GF-1 against the benefit of viewfinder and swivel LCD of the G1. Is it just me, or are most of your pictures out of focus? Do a quick search on how to frame a photograph too and you’ll find that your pictures will look better. Lumix cameras are generally for highly skilled photographers because it is very slow and very manual, not people who simply have the money to buy one. I got a GF1 with pancake lens recently, and I love it. It is by far the best ’small‘ digital camera I’ve used. I only wish they (and all other manufacturers) would go back to having the aperture ring on the lens, rather than fiddling with little buttons on the back. > double one or even more. I also had a look at the Olympus E-Series. They are also excelent cameras, but then I saw the GF1 and have fallen in love. If I would have to buy a camera now I would take the Sony Nex 5, because of the compactness. When purchasing a camera,I always look for its compactness and the small weight. Which is easy to handle during outdoors. I am now looking forward to buy a Nikon D90. Panasonic GF1 is one of the best.You have purchased a good one. By the way, can you tell us tips on proper handling of cameras and how to preserve it? Thanks for the review. My Canon G9 just shot its last shot, so I need a new compact camera. The GF1 is on my short list. I enjoyed reading your experiences with it.